Signing the gym membership paperwork is the first step toward getting and staying in shape, but the steps that follow are often more difficult. Consider your diet before setting foot on the treadmill. Your nutrition needs will be a bit different once you're exercising regularly and, what's more, eating the proper foods can give you the energy and stamina you need to achieve your goals in the gym. Don't write off breakfast when you're trying to get in shape. Regardless of when you're planning to visit the gym, eating a balanced and healthful breakfast sets the stage for a beneficial workout. Your blood sugar is low in the morning, which lowers your energy level. Breakfast gives you an energy boost and, according to MayoClinic.com, skipping this meal actually puts you at risk for obesity. Eat protein, which keeps you full for hours and helps you build strong tissue. Try scrambled eggs, a breakfast sandwich made with lean ham and a slice of cheese or a smoothie made with yogurt and protein powder. You shouldn't eat right before you exercise, since this can make you feel nauseous and weighed-down, but it's smart to eat a snack around an hour before working out to keep your blood sugar up. Eat carbohydrates, which give you energy but are quick to digest. Fruit, whole wheat toast, a small bowl of pasta or a low-sugar granola bar all will work. If you do plan to hit the gym within an hour or two of breakfast, skip the protein and eat a small meal high in carbohydrates instead. The food you eat after working out is just as important as what you eat before. Try to eat something within the two hours after you leave the gym to help your tissue recover and to replace nutrients and fluids you sweated out. Carbohydrates are again useful, since they help replenish glycogen, which is sugar that the body stores until it needs it for energy. Rice or potato dishes are examples of post-workout carbohydrate dishes, though, again, you can reach for fruit or whole wheat toast. You'll need some protein as well. Eat a handful of nuts, a sandwich made with skinless chicken breasts or a piece of grilled fish. If you didn't keep a water bottle handy before, you'll need to start once you join a gym. Exercising and sweating can bring on dehydration, but drinking during your workout isn't enough. Aim to drink around a cup of water per hour during the two to three hours before you visit the gym and sip from a water bottle every few minutes during your workout. 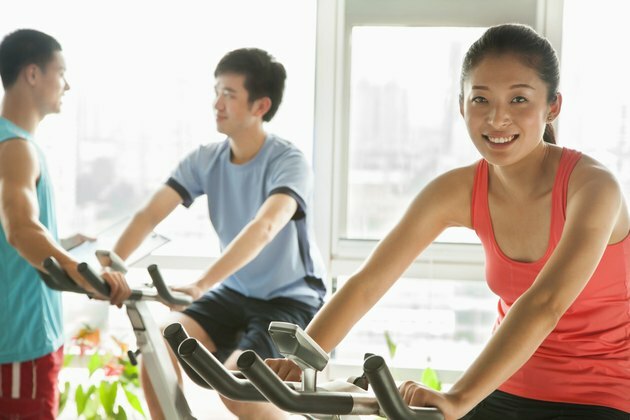 If you're exercising for more than an hour, MayoClinic.com recommends switching to a sports drink to keep your electrolyte levels where they need to be. You'll need fluids after you're finished, so keep drinking water or switch to fruit juice or tea during the two hours after exercising.